Approaching her 82nd birthday, D’Arcy shows no signs of slowing down. SOON TO CELEBRATE her 82nd birthday, Margaretta D’Arcy has been a performer, director, writer and an activist over a decades-long varied career. In recent years, however, she’s become more widely known as a result of her peace protests at Shannon Airport. Tonight, alongside Oscar-nominated director Jim Sheridan, she’ll be speaking about her life and times and her new book ‘Ireland’s Guantanamo Granny’, which delves into her anti-war protests and her time in Limerick Prison. D’Arcy has, for years, been highlighting the fact that US military planes are using Shannon Airport to stop and refuel on their way to war zones. In January 2014, the veteran activist was sentenced to three months in prison in Limerick for trespassing on the runway at Shannon Airport. Following protests, she was later moved to Mountjoy’s women’s prison the Dóchas Centre. A judge had offered to suspend the sentence if she signed a bond pledging not to enter unauthorised zones at the airport, but she had refused to do so. The campaigner was rarely out of the headlines around that time – as she received prison visits from Sinn Féin leader Gerry Adams and the President’s wife, Sabina Higgins (the two women have been friends for years). 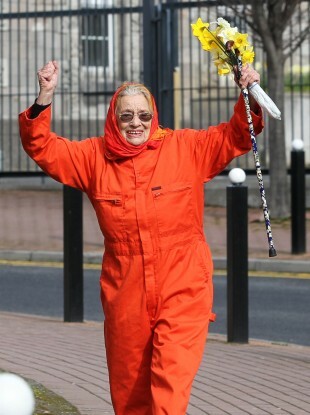 Instantly dubbed the ‘Guantanamo Granny’ by the media in the wake of her arrest, D’Arcy said in a phone interview with The Journal.ie that she was more than happy with her nickname. More and more people are becoming more aware of planes stopping in Shannon as a result of peace campaigns, she said. TDs Clare Daly and Mick Wallace, who were also arrested for protesting at Shannon, have raised the issue in the Dáil numerous times. Though she’s two weeks away from turning 82, D’Arcy says she keeps her passion alive by making everything “fun”. If everything is fun you don’t get bored. Looking back on her colourful life, she says some “random moments” stand out for her. “I like doing very absurd things” she declares, recalling the time she and her supporters held an impromptu march in the IFSC with sweeping brushes as a symbol of “sweeping out capitalism”. It’s all these little things, but doing them in a different way. Upsetting the usual ways is how to get people to notice. As a campaigner, D’Arcy has championed various issues in the course of her life. She ended up in jail in the North for protesting about the status of women in the prison system. In London, she also ended up behind bars for demonstrations against cruise missiles. Her current ongoing mission is to stop US planes from using Shannon. How long and at what cost are the government going to keep using Shannon? Spending taxpayer money on guards? One has to keep pointing out the madness. Margaretta will join Jim Sheridan, the director of My Left Foot and In The Name of the Father, at 8pm this evening at Dublin’s Smock Alley Theatre as part of the International Literature Festival to reflect on her extraordinary life. “Make peace not war, make love not hate,” D’Arcy says, as we end our interview. Wouldn’t Ireland be a fun-loving, peaceful place if we did this. A shining example for the world! Email “Margaretta D'Arcy's secret to an interesting life: keep things fun (and avoid meetings)”. Feedback on “Margaretta D'Arcy's secret to an interesting life: keep things fun (and avoid meetings)”.